Soooooo, what is going onnnnn? If you’ve followed me or the podcast for a while, you will have heard me mention or speak about pivoting many times – that I’ve done more pivots than a ballerina. SHE is gone, and in her place, is a more complete woman. The podcast is continuing but s h e is not. The thing is, I never liked the SHE name. I cringed every time I used it. It never truly reflected me as a person, what I am like, nor the audience I have. I hate the word entrepreneur – it’s overused and I’ve mentioned my thoughts on this in a previous episode. I never intended to use it actually, but I couldn’t come up with a better fit, and just wanted to launch, so I used it got on with it. I also wasn’t a huge fan of the School-Hours tag – I didn’t want the show to be interpreted as being a mum type of show. Yes, it’s a big part of it, but my focus is about being more than a mother and having the spotlight on us, as women, not as mothers. I don’t want my identity being based on the fact I’ve had kids. My husband has kids, his identity is still his own – and I want the same and I also want that for my audience. Yet, I needed something that identified us without using the word mum. So I went with it and the SHE acronym helped jazz it up a little But I never felt truly comfortable with it and if you don’t LOVE what you’re doing, you won’t do well with it because you always hold yourself back a little. And I definitely do that with this show. I hold back in so many ways because it just hasn’t been quite right, and that is depressing! I have such a clear mission and vision for what this show can be and do for women, but it won’t happen if I hang on to something that isn’t working instead of jumping into something that feels better – feels more right. The other reason it hasn’t been working for me is the idea of limiting conversations to business. Even though I rarely discuss just business on the show, and it’s all about the background stories, I still felt hamstrung by the show’s title. There is so much more to me – to you – than compartmentalised sections. And there’s so much more to business than an SEO strategy or launches or sales copy. For us, it’s about our why, about juggling the other elements of life, and the frustrations and challenges that go with that. It’s about intuition and women rising and so many other things! And my greatest message, what my blog and business started with, is that of women not having to sacrifice elements of life in order to have a family. Balance and fulfillment have always been my central messages, and the podcast sprang up as a part of that – starting a business to have greater freedom and flexibility to balance family. It’s about having something of your professional self remain intact and not have to give everything up. It’s about having a Complete Life – not having to sacrifice yourself, but also not living overwhelmed because you’re doing things you don’t want to. What is a Complete Life? A complete life is living a life that feels complete for you. That feels right and true for you. It’s the concept of having it all, but not doing it all. It means defining specifically what having it all looks like and is for you, not what we ‘think’ it is or should be. That means being honest and real with yourself – being clear about your priorities, making room for them, and shedding everything else. This is not necessarily easy and it is different for all of us. And I hope to show this through the interviews and episodes. I hope to show you, and me, that there is always a choice and way forward. That we can do away with shoulds and stereotypical ideas of success. I think these ideas are central to our success – because if we’re ignoring all the other parts of our life in order to make a business ‘fit’ a certain way and it’s not working, then why are we doing it anyway? Working, business, staying at home, family time, health, financial security, travel and adventure, connections, creating, spirituality – a complete life has many different moving parts, and many different options. We must choose the parts that mean the most to us, and learn to say no to the things that we either don’t have time for or that weigh us down. Finding out all of that, and knowing how to embrace what we want and let go of what we don’t, is the tricky bit. 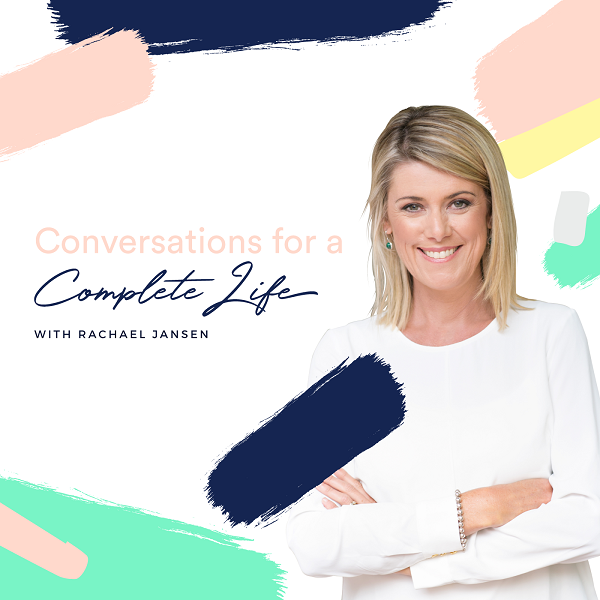 And so the podcast is shifting to Conversations for a Complete life, so that we can together learn all the things we need to, from those who have gone before us. Yes, some of these conversations are going to be about business, helping us build a business as that is such a big part of a complete life for me, and for many of us. I still firmly believe that a business of some kind can be the salvation many an over-worked and overwhelmed woman needs. That said, even in business, we can still be over-worked and overwhelmed, so some lessons on those topics won’t go astray, right? So the conversations will expand to accommodate those ideas and lessons. How to live our own lives courageously. To continue to be inspired and informed, but in all areas, from our hormones and body image, to ageing, parenting, mindset and fear, love and relationships, and fear, integrity, money and achievement. It’s all a part of the overall picture. We can’t separate these other elements, these lessons, from business, because they all affect the other. Everything is linked. Business has already taught me so much about life – I’ve learned about mindset, fear, so much tech (bloody SEO) and about community. Those lessons I’ve applied to the way I live, to the way I parent. It’s forced me to continue to expand my knowledge, to dig deeper into concepts such as choice and courage. From my health coaching qualifications and lifestyle, I know hormones can wreak havoc on your success and ability to handle stress. And the stress wreaks havoc on your hormones. Hello vicious circle. I know women of my age need answers to manage all of the elements they’re juggling – whether that’s business or a career or a getting-by job. Relationships, health, stress and more stress. We’re all looking for an answer or support – and we need them so we can live a life that feels relatively balanced but most of all Complete – complete in that it suits us best, however it looks. So Conversations for a Complete Life is here. I’m really looking forward to delving deep into this idea and concept, and I’d love to hear your ideas on the topic so that I can bring you shows that address your thoughts, concerns and challenges. What do you find challenging or struggle with? What pieces of the complete life puzzle are you finding hard to fit in at the moment? What does your complete life look like?